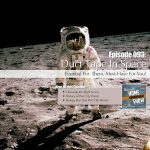 EP93: Which Screw to Choose, History and True Stories of Port City Paints, and Duct Tape in Space! We’ve been building a lot of things for home shows recently. And it seems as though we are constantly running out to get new screws. Either we don’t have the right size, or they aren’t working the way we need them too, or we just plain don’t have enough of what we need. It’s a bit maddening! In our first segment, we’ll dig in to what we’ve recently learned about screws. We’ll talk about the different types, how they came to be, what we found works best, and why it’s so important to have an organized stock pile. Our second segment is ushered in with our very own Abe Pastoor from port City in Muskegon. Port City is part of the RepcoLite family and Abe shares its long history. He also tells us some crazy stories about the building that are actually true. Creep factor anyone?! And finally, the pièce de résistance, a segment all about duct tape. And not just any segment about duct tape. It’s about duct tape in space and why it’s a critical part of the gear astronauts ALWAYS have. If you are interested in reading some of the amazing stories of duct tape in space, check out the NASA website. Or read the most recent story of duct tape on the ISS. And if you just want a guaranteed smile, check out this short clip of Astronaut Gene Cernan skipping and singing on the moon.